1Department of Applied Chemistry, Tokyo Metropolitan University, Tokyo, Japan; 2EEN Co., Ltd., Tokyo, Japan. 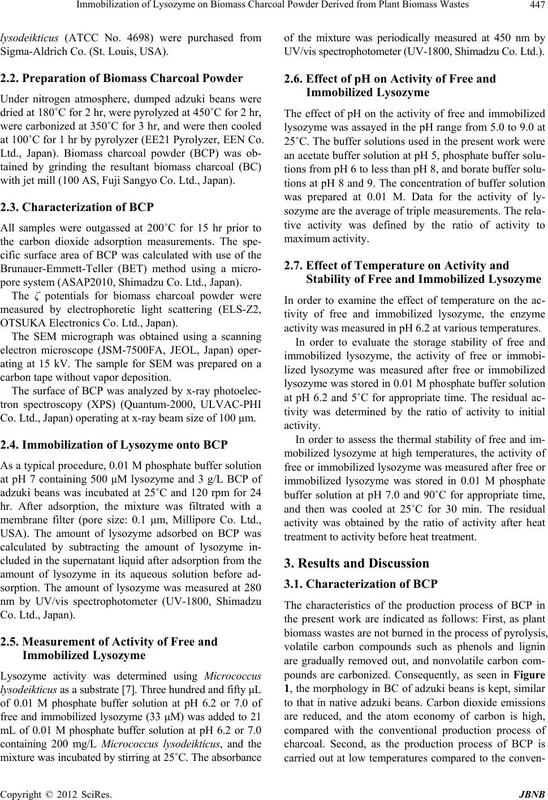 bilized lysozyme was 7 times greater than that of lysozyme at 90˚C. 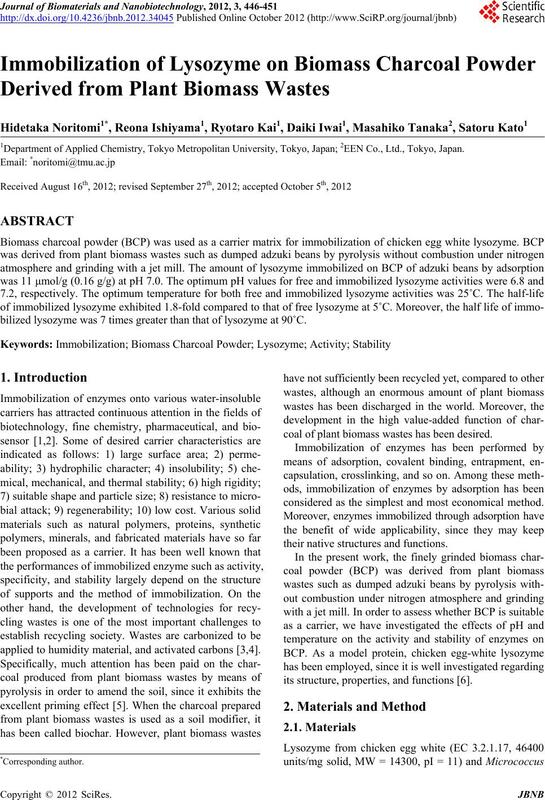 applied to humidity material, and activated carbons [3,4]. coal of plant biomass wastes has been desired. considered as the simplest and most economical method. their native structures and functions. its structure, properties, and functions . Sigma-Aldrich Co. (St. Louis, USA). at 100˚C for 1 hr by pyrolyzer (EE21 Pyrolyzer, EEN Co.
with jet mill (100 AS, Fuji Sangyo Co. Ltd., Japan). pore system (ASAP2010, Shimadzu Co. Ltd., Japan). OTSUKA Electronics Co. Ltd., Japan). carbon tape without vapor deposition. Co. Ltd., Japan) operating at x-ray beam size of 100 μm. UV/vis spectrophotometer (UV-1800, Shimadzu Co. Ltd.). activity was measured in pH 6.2 at various temperatures. treatment to activity before heat treatment. ronmentally benign process, and has no toxicity. potential of BCP of adzuki beans was –47.6 mV at pH 7. BCP detected by x-ray photoelectron spectroscopy (XPS). adsorbed onto BCP of adzuki beans at pH 7 and 25˚C. ried out for 24 h.
Figure 2. SEM image of BCP of adzuki beans. on BCP of adzuki beans. 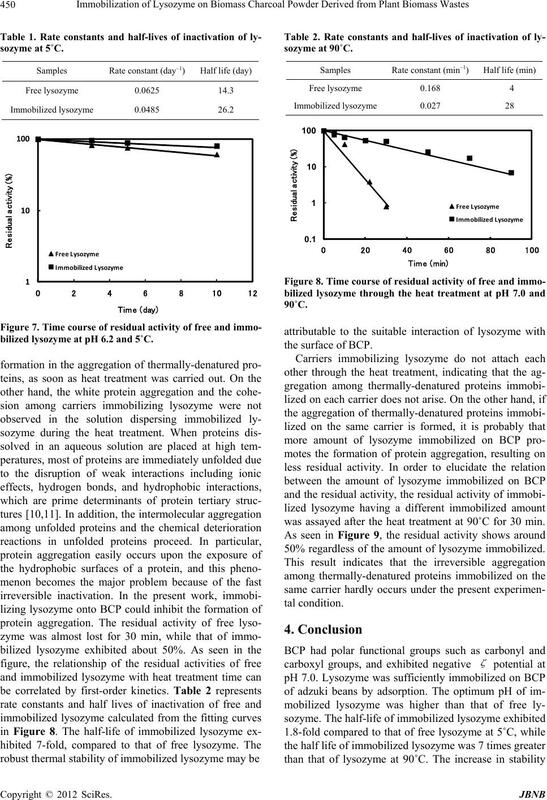 beans to that of free lysozyme, exhibited 0.55.
environment surrounding the immobilized enzyme . function observed in solution, as seen in the figure. pH is taken as 100%. mum temperature is taken as 100%. 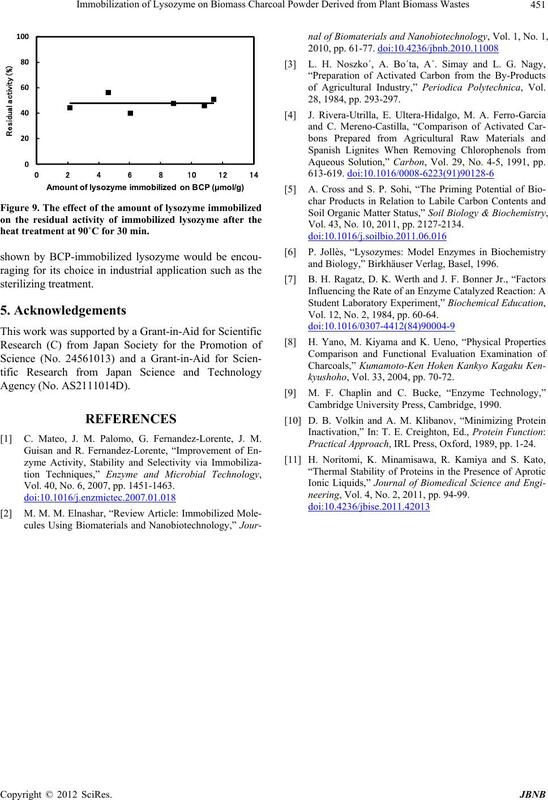 maintenance of the activity of immobilized lysozyme. 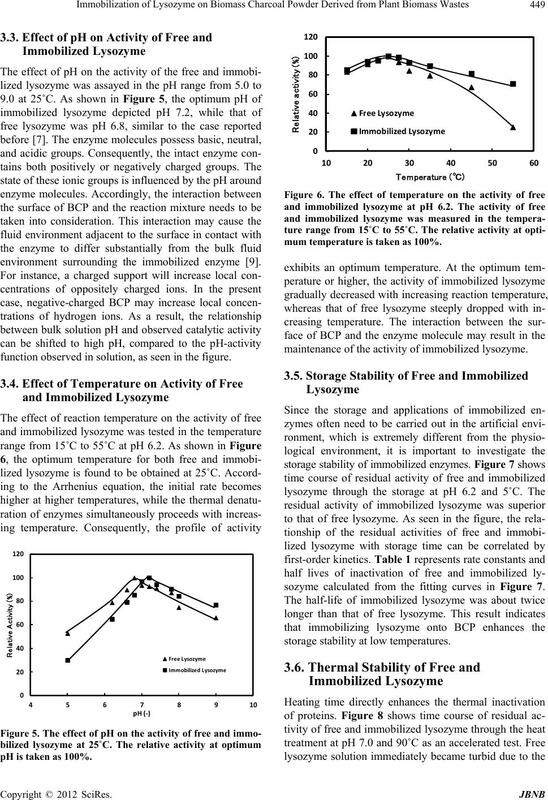 sozyme calculated from the fitting curves in Figure 7.
storage stability at low temperatures. bilized lysozyme at pH 6.2 and 5˚C. was assayed after the heat treatment at 90˚C for 30 min. 50% regardless of the amount of lysozyme immobilized. heat treatment at 90˚C for 30 min. C. Mateo, J. M. Palomo, G. Fernandez-Lorente, J. M.
Vol. 40, No. 6, 2007, pp. 1451-1463.
of Agricultural Industry,” Periodica Polytechnica, Vol. 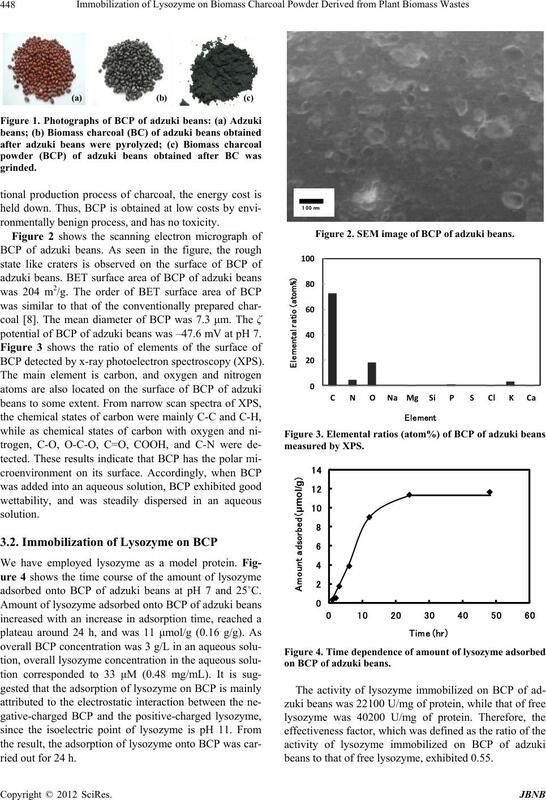 Aqueous Solution,” Carbon, Vol. 29, No. 4-5, 1991, pp. Vol. 43, No. 10, 2011, pp. 2127-2134.
and Biology,” Birkhäuser Verlag, Basel, 1996. Vol. 12, No. 2, 1984, pp. 60-64.
kyushoho, Vol. 33, 2004, pp. 70-72. Cambridge University Press, Cambridge, 1990. Practical Approach, IRL Press, Oxford, 1989, pp. 1-24.
neering, Vol. 4, No. 2, 2011, pp. 94-99.